Yesterday I reviewed Robert Oster Heart of Gold, from the Shake 'N' Shimmy Holiday 4-pack, so today is another ink from the same pack, Robert Oster Peppermint Candy. I purchased the pack from Pen Chalet. Peppermint Candy is Robert Oster Peppermint with green shimmer, at least that's my guess from the color and the name. Seasonally, this is perfect for Christmas. 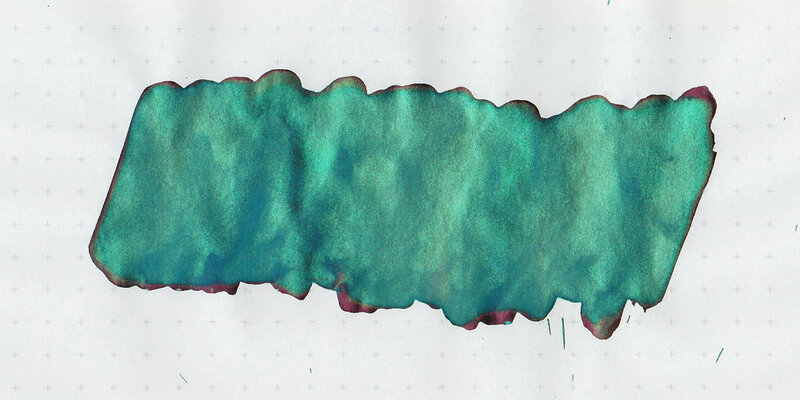 I have reviewed quite a few shimmer inks in the past few months, but this is the first shimmer ink I've seen that has green shimmer. So far all of them have had silver or gold, so this is a nice change. You can see the reddish-pink sheen around the edges of the ink drops. Other properties: Medium shading, most of it is covered up by the shimmer, low sheen, and green shimmer. I love that the shimmer is the same color as the ink. On 20 pound copy paper there was a little bit of feathering, but other than that the ink behaved well. Ink swabs for comparison, left to right (top to bottom for mobile RSS): Robert Oster Peppermint, Robert Oster Peppermint Candy, and Diamine Magical Forest. Click here to see the Robert Oster inks together, the Shake 'N' Shimmy inks are at the bottom of the page. 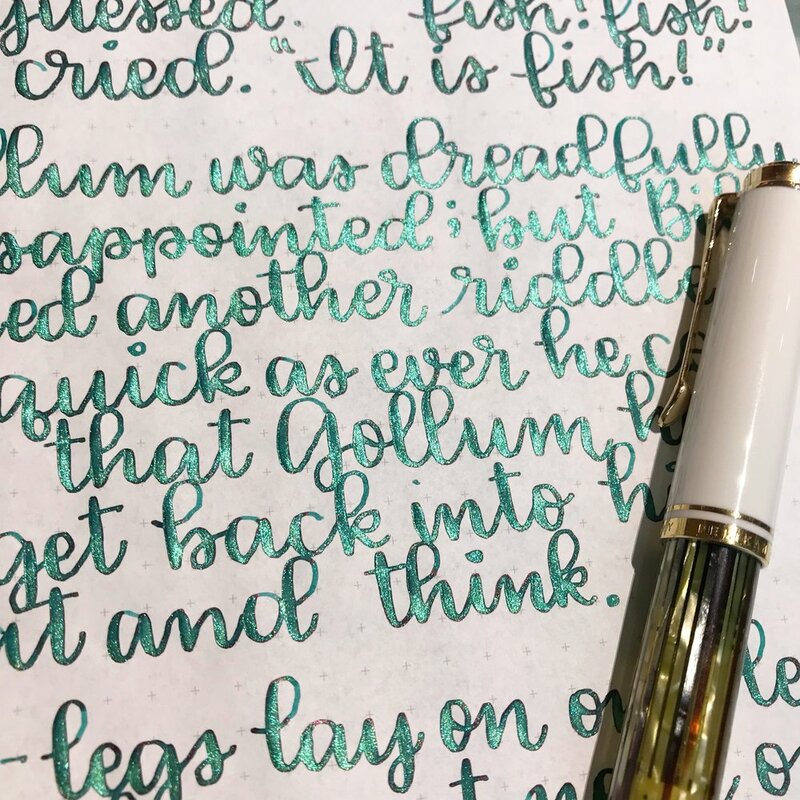 Robert Oster River of Fire, Robert Oster Spearmint, and Diamine Golden Ivy. Click here to see the green inks together. I used a Pelikan M400 White Tortoise fitted with a vintage 400N nib on Tomoe River paper. The ink has a wetter flow. The shimmer clogged the feed once during writing, so I pushed a little more ink into the feed and it took care of it. As with all shimmer inks, I rotated the pen after each paragraph to keep the shimmer in suspension. Other than the one clog, the ink flowed well in all of the pens. Overall, so far I have been really impressed with the Shake 'N' Shimmy inks. They are packed full of shimmer and look amazing. This ink is currently only available in the 4-pack, each bottle holds 15ml. I think right now this is my favorite green shimmer, It's perfect for Christmas time.